Yeah, yeah, I know. We have one of the coolest jobs around. We complain about the lugging and lifting, the low profits and the long hours. But seeing people buy books that can make a difference in their lives is still thrilling for us. (Did you see my column “Reading Matters” in The High Calling blog yesterday?) The occasional gift of meeting an admired author or hosting a local event–and having so many friends and customers respond with enthusiasm–well, it reminds us that this indie bookstore thing is still viable. Dr. N.T. Wright is one of the most recognized, important Biblical scholars and church leaders of our time. I can’t name another world-class, scholarly leader who also writes books for ordinary lay people, who has bridged the gap between the academic guilds and local congregations. I wrote about Old Testament scholar Walter Brueggemann in our previous BookNotes post, and his name comes to mind. Dear Walt isn’t as well-known or appreciated in evangelical circles, though, and although he is deeply committed to the church, and preaches a lot, he hasn’t been a pastor and Bishop the way the Reverend Wright has. Nor has he gotten in the popular press (from Time to Colbert.) In many ways, N.T. is in a class by himself. And so, we are very pleased to announce that this most significant scholar, author, pastor, church official, and now renowned professor–his classes aren’t easy, I’m told—at the prestigious University of St. Andrews in Edinburgh, Scotland, is dropping by Hearts & Minds on May 12th. The informal reception will begin around 1:00 p.m. Tom will autograph books, we will have some refreshments, and, Lord willing, we’ll have chairs out back for folks to linger in our back yard. Wright will not be lecturing or presenting material, although having met him, he is cordial and engaged, so we are hoping for good conversation. Come and plan to “sit a spell.” (There will be a few other authors present, too, by the way, friends who themselves are showing up to meet the man.) We’re hoping Tom will enjoy our small town informality, and appreciate meeting Hearts & Minds fans and friends. Like I said, this is one of the coolest jobs in the world. You make it so, since an author appearance is a bust if folks don’t show up and buy some books. We anticipate that we will have a large crowd. Parking is sparse here, so you’ll have to park in one of several lots behind churches and schools here in the area. (If it is raining, we’ll think quickly and get some shuttle thing going.) Pray for good weather so folks don’t mind walking a few blocks from up or down the street here in Dallastown. For those who can’t come—or those who may need a refresher course—I’m working on a hefty post describing his many books, old and new, academic and less so. There is some controversy in some very conservative circles, about a bit of his work, but we don’t fret about most of that. His books are among our favorites and we highly commend them to you. Here is a link to a wonderful overview of Wright’s life, faith journey, academic career, and a summary of his important work. It’s a bit long but very interesting. Below are two lovely, short video interviews explaining his vision for his last two books. We have both books at a 20% discount for our mail-order friends for the next few days. First he describes the recent Simply Jesus: A New Vision of Who He Was, What He Did, and Why He Matters (HarperOne; $24.99) and in the next he talks about How God Became King: The Forgotten Story of the Gospels (HarperOne;.$25.95.) These are wonderful, wonderful books. Enjoy these two trailers and help us spread the word, about the books and our party here with Tom on May 12th. Thanks. FIVE DAYS ONLY. OFFER EXPIRES MAY 9, 2012. Will he be autographing books that are ordered by mail? I am wondering about some gifts. For those who haven’t heard the backstory, Wright is lecturing Friday at the wonderful Ecumenical Institute of Theology at St. Mary’s Seminary in Baltimore. He’s also their commencement speaker Thursday night (that’s the caliber of place it is!) We have the privilege of serving their event by providing books for sale, Friday afternoon and evening. Since Wright is in the area, our friends at the Ecumenical Institute will bring him here. We mentioned his Baltimore lectures at facebook and twitter quite some time ago, but didn’t mention it above since there were already at capacity — it’s a sell out crowd! The EI is doing some great work (we’ve sold books with them there for lectures by Eugene Peterson and Miroslov Volf, too, in the past year.) A few friends have attended classes, working on an advance degree, and loved it. We are grateful for their support of our little efforts here at the shop. How exciting, Byron. How I wish I could make this vital event but I have family plans today. I pray it goes wonderfully, that you sell many books and God’s kingdom purposes are furthered. 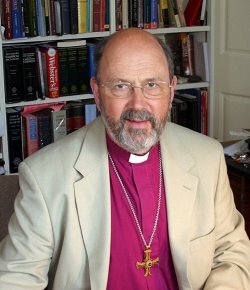 Please give my regards to Bishop Tom (have only emailed a few times). I have such tremendous respect for him and his scholarship. The one link to his bio was quite interesting. I did not realize he was a conservative Reformed evangelical early on in his career.